NWS has issued a winter storm warning for areas along and north of I-59; a winter weather advisory has been issued for areas as far south as Jackson, Monroeville, Prattville, Wetumpka, and Lafayette. TIMING: Rain will change to snow across the northwest corner of Alabama around midnight; the snow begins in places like Birmingham, Tuscaloosa, and Gadsden as early as 4:00 a.m. Most locations will see only about 3 hours of snow, but snow rates could be heavy at times. AMOUNTS: Amounts up to 2-3 inches are possible in the winter storm warning area (along and north of I-59), with amount of 1-2 inches to the south in the winter weather advisory. 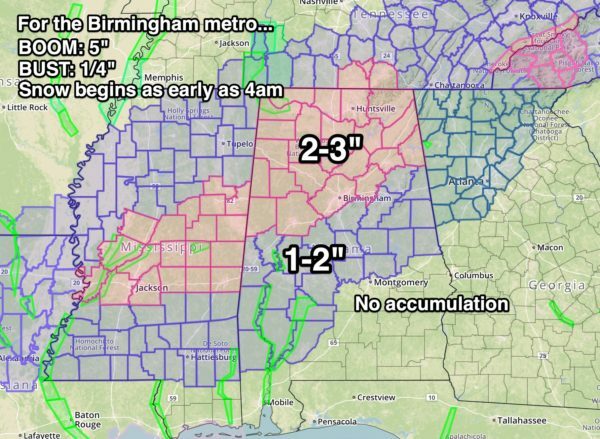 For the Birmingham metro, the “boom” value is now 5 inches. Not likely, but not out of the question. The “bust” value is 1/4″. This is the potential range, and a way of communicating uncertainly in the forecast. 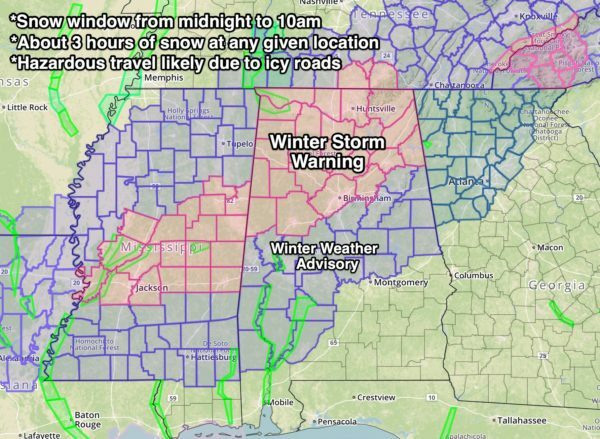 IMPACT: Travel is expected to become dangerous tomorrow morning as the snow falls. Initially ice will form on bridges, but there is a chance black top roads could become snow covered and icy. The sun will break out tomorrow afternoon, pushing temperatures into the mid 30s in some places. This will help to improve road conditions temporarily, and hopefully drier air moving in will accelerate the evaporation process. But, any lingering snow or water on roads will likely refreeze tomorrow night into Wednesday morning, when temperatures will drop into the 18-24 degree range. The extent of travel impact Tuesday night and early Wednesday is somewhat conditional; it all depends on how much evaporation/drying happens Tuesday afternoon when the sun comes out. We project a high Wednesday afternoon in the low 40s with a good supply of sunshine, so road conditions should be back to normal by late morning Wednesday. We rise to near 50 Thursday, and mid 50s Friday as the warming trend continues. POWER OUTAGES? We don’t expect any power outages. No freezing rain or ice accumulation. Just light rain changing to snow. BUT MY APP SAYS NO SNOW??? Automated weather apps (most all of them are automated) are pretty much useless in this kind of situation. Always check with actual professional meteorologists who give you information like you are getting on this blog post. Timing, amount, uncertainty, etc. Apps use raw computer model data without any human intervention, and can lead you down a bad path. REMEMBER: Not everyone in the winter storm watch will get snow. Some will get nothing at all. And the volume of social media posts about snow is not necessarily directly proportional to the amount of snow we’re actually going to get. It seems like the more people are talking about it, the worse it’s going to be, but that’s not always the case. This is a fairly light snow event; remember we are looking at one to two inches for most communities across North/Central Alabama. And, if you want the most accurate and up-to-date information, you will have to check the forecast several times a day. Otherwise, you’re working with old information.